Karoujite is a Japanese word meaning barely, narrowly or just managing to do something. Here, Cristian Alvear and Seijiro Murayama barely manage to do something that's very difficult, to repeat as much as possible, one sound. The cover art for the disc illustrates the idea, with it's repeated image of the two men playing in a wooden room. 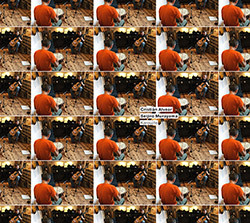 Look closely though and you'll see that not all of the images are identical, that there are a few variations. And so it is with the music, which is comprised of simple gestures: a bowed cymbal or a rocking wooden clacking sound coupled with a plucked chord or single note, each pairing attempting to simply repeat for a short time. To some, this may not be music at all, just an illustration of human folly. But pay attention and there is much happening in these well-recorded pieces. Over time the instruments loose their identity, like repeating a word to yourself until it's just a sound. These exercises perhaps point out the difficulty of the undertaking, the propensity of the mind to wander, of the nerves to rebel. Do Alvear and Murayama succeed?